Football financier Keith Harris's latest offer for Portsmouth has been dismissed by the Football League. Harris offered to give Pompey fans a free 15% stake in the club as part of a revised offer for the stricken outfit. But the league have confirmed the only bid they would consider was from the Pompey Supporters' Trust (PST). "The Board is not considering alternative applications for the transfer of Portsmouth's share in The Football League," said a statement. Harris's initial offer for Pompey was previously rejected by the Football League. The club has been in administration since February 2012 and is believed to be around £61m in debt. "We are about to get 100% of the club as Pompey fans so why on earth would be interested in an offer giving us only 15%? The preferred bidders, PST, have been approved by the Football League as well as the club's creditors. The Football League statement confirmed: "It remains focused on a successful transfer of share to the preferred bidder, the Pompey Supporters Trust." But the Trust's takeover is conditional on the group taking control of the club's Fratton Park stadium. The ground is currently controlled by the side's former owner, Balram Chainrai, who believes he is owed £12m by Pompey and holds the stadium as security via a fixed charge. The PST had offered Chainrai £3m for the ground but the Hong Kong-based businessman has so far refused to sell. 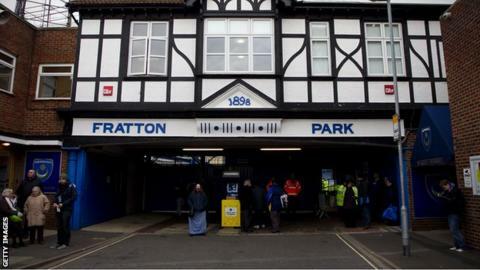 Administrators PKF are attempting to force the sale of Fratton Park through the High Court, as well as seek an independent valuation, although the hearing has been adjourned several times. However, on Monday, the Harris-led bid announced an "option to acquire the stadium from the current owners is in an agreed form and will be completed immediately following the takeover" and Football League approval was the only stumbling block in taking control of the club. The statement added they would hand 15% of the shares in the club to a group made up of supporters who have donated funds to PST, season-ticket holders and hospitality clients. It was also proposed that a fans' representative will be elected to the board following any takeover. REL - Robinson Estates Limited. Season-ticket holders, meanwhile, would have received a 10% discount for the next three seasons starting in 2013-14. A statement on behalf of the Harris-fronted bid stated: "Funds to complete the purchase are ready to be transferred to a UK solicitors' bank account and therefore ready for immediate release, subject only to the consent of The Football League. "Negotiations to purchase the club from the administrators and a payment plan to satisfy the PFA have now been completed and the agreements are ready for signature. "Our bid has the full support of the creditors' committee including HMRC and the PFA as it gives a much greater return to creditors than the PST proposal. It also complies fully with the terms of the CVA. "The only outstanding issue remains the consent of The Football League, and all paperwork in that regard including the business plan, and stadium lease and purchase, are available for immediate consideration by the board of The Football League." Pompey Supporters' Trust spokesman Colin Farmery said they were not interested in the offer from Harris anyway and that they remain on course to take over the club. "The timing is curious," Farmery told BBC Radio Solent. "Our immediate reaction is why now when the PST is on the verge of completing a deal for Pompey Football Club? "We are about to get 100% of the club as Pompey fans so why on earth would we be interested in an offer giving us only 15%. "The Football League statement was very robust and they have made it clear they only want to deal with us. Our bid is credible and ready to go. Our bid will ensure that we own Fratton Park from day one and make a total and clean break from the past."